Leads are on the internet. Leads are searching for you. In our post titled Real Estate Leads are Searching for YOU, we met Bob, a potential lead. Bob is a typical home shopper (or seller), and he’s on the internet. He wants to find the right Realtor, but finding one has been a bit of a challenge. Bob is frustrated that not many Realtors have personal business websites. Bob’s experience proves that there is a huge opportunity for any Realtor who has a website. Just being on the internet with a website is an advantage. Just “being on the internet” isn’t the only reason for having a website. 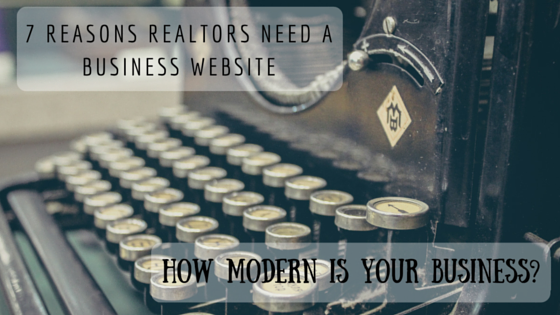 There are many more specific reasons that having a website is important for every Realtor’s business. Let’s investigate 7 of the most important reasons for Realtors to have a personal website. A Realtor is a business owner. Every business has a website, right? Realtors don’t work for their broker. Realtors work for themselves. Relying on the broker to generate their online business isn’t the best business plan. Every major brand in America has a website, obviously. We would all be confused if Apple didn’t have a website, or Target didn’t have a website, or even Olive Garden. But small businesses need websites too. Consider how much research you do when you need services from a small business. Let’s say for example that you need a new roof for your house. You have no idea how to find a roofer. Roofers are small business owners. So your first idea is to Google “roofer in Anytown”, because your assumption is that every business should have a website. The only roofers that you will consider are roofers with a website. Why? Because if you’re searching for a roofer on the internet, and a roofer doesn’t have a website, then you don’t know that the roofer exists. You might go to Yelp, Angie’s List, or some other resource. But those provide links to roofer’s websites if they have one. Which roofer are you more likely to learn about? A roofer with a website, or one without a website? A website doesn’t sleep, it doesn’t take lunch breaks, and it doesn’t have kids that have soccer games. A website has potential to generate leads 24 hours a day, 7 days a week. No Realtor can work nonstop like a website can. You work during the day. You’re busy trying to build your real estate business, generate leads, convert leads to clients, show houses, and hundreds of other tasks. You don’t have the time to call multiple roofers, leave messages, wait for them to call back, and set up appointments with all of them. Roofers are also busy during the day. They’re actually installing new roofs for their clients, quoting projects, and many other business associated tasks. They can’t always answer the phone right away, but will almost always call you back. This just turns into a game of phone tag, multiplied by the number of roofers you want to have quote your project. When you do finally get a roofer on the phone, you end up talking to multiple roofers to ask about their business, learn if they do residential projects like yours or only commercial, find out if they even have time for more work, schedule a time for a quote, and everything else you need to know. Or you can research roofers on your own time on the internet, fill out online contact forms, and wait for an email response from them to find out when they are available. You could do this after dinner or even while watching the morning news. Point is, you can research a roofer and contact them when the roofer probably isn’t working. On your own time. The internet is amazing! The website allows a visitor to learn about the Realtor, the Realtor’s specialties, and the Realtor’s niche. A website is a business card for the Realtor. A great website SELLS the Realtor to the lead. When you visit each roofer’s website, you want to learn about them. Do they specialize in roofs like yours? Do they service your area? Do they have pictures of work that they have done? Do clients leave good testimonials? You will probably find some roofers’ websites where you learn that the roofer is not right for you. Maybe they only do commercial roofs. Maybe they don’t have any good reviews. Maybe they only specialize in certain roofing materials. Who knows? Maybe there was just something you didn’t like about the roofer. But you will likely also find one or two roofers that appear perfect for the job. Why? You’ll know when you know. It’s the way the roofer branded themselves. It’s the way the roofer SOLD themselves on their website. If you don’t need a new roof, what is the likelihood that you would ever go to a roofer’s website? Pretty close to zero. The second you contact a roofer, that roofer knows that you are a qualified lead. Then it’s the roofers job to close the sale, and make sure he converts you from a lead to a client. Nobody contacts a random roofer just to talk roofing. A roofer can’t convert a random conversation into a client. A website makes it easy for clients to refer the Realtor to leads. Clients lose physical business cards, but they can always Google the Realtor’s name to find their website. When potential leads need a Realtor, a website makes it easy to refer to the lead. Now let’s say that you are fortunate enough to have a neighbor who got a new roof last year. That neighbor tells you that they did a lot of research to find the right roofer, and suggests the roofer that they used. Perfect! That neighbor has the same type of roof as you, a house in the same class neighborhood as you, and several other reasons that suggest the roofer that they used would be a good fit for you and your roof. They are referring you to their roofer. One problem. Your neighbor doesn’t have the roofer’s number and lost the roofer’s business card. But by Googling the roofer’s name and a few other keywords, you were able to find the roofer’s website. Had the roofer not had a website, your chances of ever finding that roofer would be very slim. Having a good website makes a Realtor appear more professional to a lead. And considering how few Realtors have a good personal website, it is an easy way to stand out. You have two roofers to choose from, but only have time to get a quote from one of them. One roofer without a website, so all you have to go on is his name or maybe one or two Yelp reviews. You’re preparing for phone tag and setting aside time to explain why you need a roof, where you live, what their schedule is like, and on and on. The other roofer has a website. You learn everything you need to know about the roofer from the website. You prequalified the roofer before you even contact them. Which roofer would you contact? For everything that a website provides the Realtor, the cost is easy to justify. Websites return some of the best value for any marketing spend for Realtors. A typical website will take much less than one closing to pay for it for an entire year. Do you think roofers get into the roofing business to get rich? Do you think roofers want to spend more money than they need to? Probably not. So why do some roofers have a website? Because a website helps their business, and a website is inexpensive. Realtors are small business owners just like roofers and many other local businesses that you need service or products from. In the 7 Reasons above, you can interchange the word “roofer” with “Realtor”, switch up the roofing terminology to real estate terminology, and it would apply to your business. Realtors need to treat their business like a business. Realtors need a personal website for their business. If you want to learn more about a Realtor website from Agent Sidekick, then feel free to take a Product Tour to learn more about the website that we can make for you. If you know a roofer who needs a website or other marketing help, we recommend Roofing Sidekick (no affiliation to us at Agent Sidekick). But please tell them Agent Sidekick sent them.